We decided to try Rekados for lunch the other day. Prior to that, lunch is probably the most problematic meal of all for us. Breakfast, for me, is not a question. It usually is coffee and a cup of yogurt. Or, coffee and banana. It seems that I have no problems repeating the same meal over and over for breakfast. I lived on oatmeal for more than 6 months at one stretch of time, with no complaints. With dinner, it has to be, without question, varied and interesting. Embarrassing to admit but I do get grumpy and cranky if I do not get a good dinner every few days. I can stretch out to four or five days, sometimes even two weeks, but people don't want to be near me when I'm in one of these moods. I like variety and I cannot endure the same type of food for more than 3 days at a time. And I like my food to have honest-to-goodness proper flavour, something soul-satisfying as well. As the midday meal, lunch stands in-between these in terms of wishing and expectations. There are days when we don't even have time for lunch (hence the demand and/or wish for a good dinner). There are days when we just have to endure a day-old sandwich and/or soup with crackers. But fortunately, there are also days when we have the luxury of choosing a proper lunch. I think the Rekados lunch qualifies as a proper lunch, don't you think? Growing up, we were just used to our lunches being just like dinner. 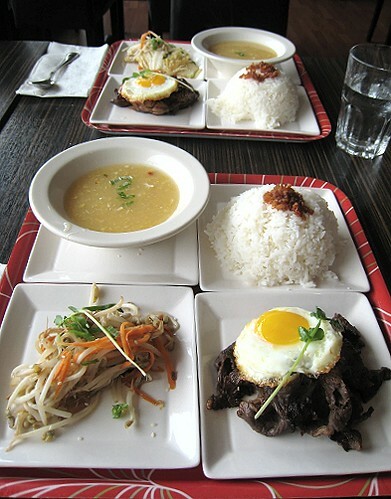 Same types of food: rice and hot dishes to go with it. Sandwiches or anything of the sort qualified merely as "snacks." Here's to Rekados and the "old days"! 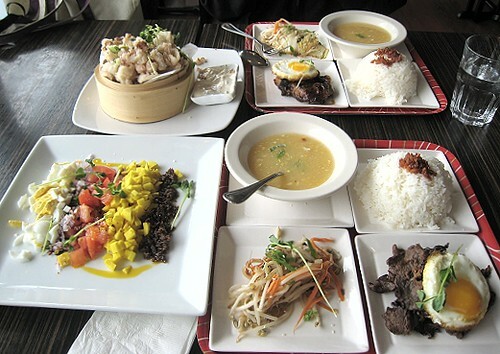 As part of their lunch menu, Rekados has "combo" meals which include a meat dish, a vegetable dish, soup and of course, rice. I don't usually look at the prices, but these meals are $6.95 and $7.95. Quite a steal! Soup that day was corn soup. 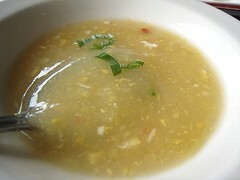 On other occasions, we've had sotanghon soup (a vermicelli soup flavored with achiote) and a tomato-based broth. 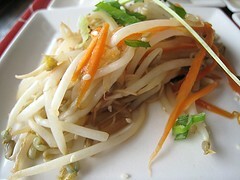 The veg was bean sprouts. Other times, we've had bok choy, green beans, and so on. 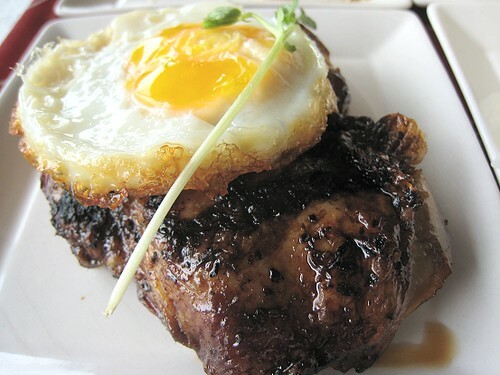 Chicken adobo with fried egg (JS's dish). I had the "beef tapsi". That's short for tapsilog, one of the beloved "silog" type dishes, so called because it's beef tapa + sinangag (garlic fried rice) + itlog (fried egg). I promptly put my egg on top of the sinangag and broke the yolk. Oooooh. And yes, that meal's just for two people. Granted, we were kind of, sort of full afterwards. I don't think we even had room for the warm toffee cake! Oh, they've brought it back! The warm toffee cake is back!!! I guess our laments and our ode to the warm toffee cake (here and here) were heard! Rekados is such a (relatively) undiscovered gem. We always shake our heads at why people aren't clamoring to dine there. People, go! oh my goodness!! thank you for sharing this experience..i terribly miss the food of my homeland :-) tapsilog, adobo and all that are part of my gastronomic culture :-) i love it!! BTW, have you tried the new Ongpin Restaurant in Richmond? It's along #5 Rd. and Cambie. The menu is very similar to Pinpin. 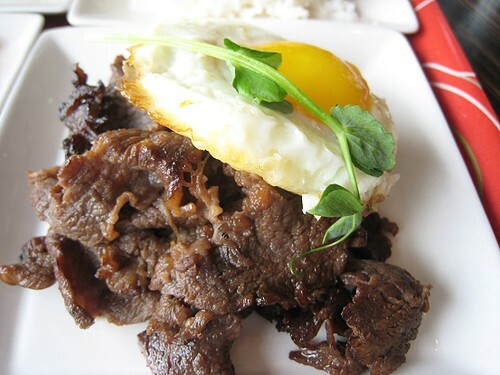 that tapsilog and chicken adobo with egg made me drool... looks YUM! The photos are torture!!!!!!! 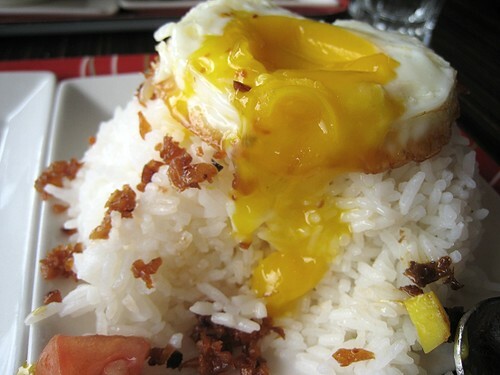 I want that tapsilog! I have to say though, that when i went and i ordered adobong spinach, it was really really really bad....not like the original stuff at all. Will go back to try the tapsilog for sure.